About 16 years ago I met my husband. We were both DJs at the university radio station. I had the graveyard shift and he had the (more sensible) shift just before it. One night I came in, running late, all in a tizzy because I didn’t have my playlists ready. I was a wreck with too many other unimportant things going through my mind. Chris didn’t say anything, he just put his hand on my shoulder and I felt this peace envelope me…he was my rock then and he still is. And yes, he does do dishes. And change diapers. And read bedtime stories. 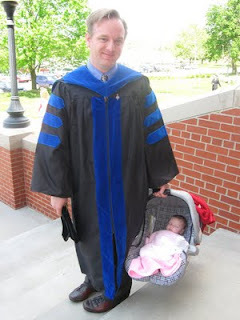 And carry the baby even when he's in his academic regalia.